It is a great honour for me to take part in this event with you all. 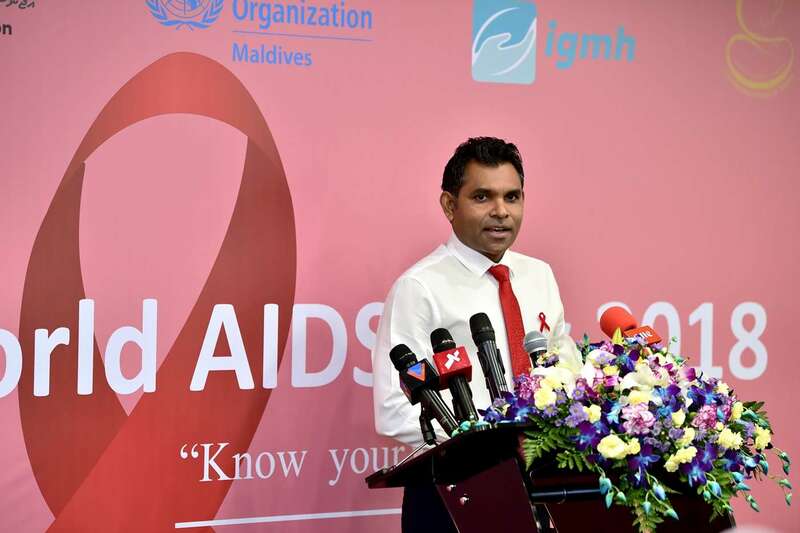 As we mark this year’s World Aid’s Day, it is encouraging to learn about the Maldives’ remarkable achievements in maintaining its status as a low prevalence country for HIV. This year’s World Aid’s Day theme, “Know Your Status” is especially fitting for the Maldives as it aims to sustain its low prevalence country status, and fight against HIV through appropriate prevention policies, and support to people with HIV. It is of great benefit to this cause that we in the Maldives are in a situation where we are able to create space and opportunity to run strong preventive programs. Testing, ‘knowing your status’, is essential to implementing successful systematic prevention programs and providing those with HIV the opportunity to make choices that allows for the protection of themselves and others. Civil society and community based Organizations are crucial in this process. The Maldives could never have achieved what it has without the active participation of these critical stakeholders. I take this opportunity to appreciate the work of NGOs, and specially the Society for Health Education for leading very important segments of the HIV prevention programs. I think it is also time that we again start work together to eliminate all the challenges that we have. And listening to your speech, yes we have a number of foreign migrants here. That the Government Authorities need focus on, and again eradicate all the barriers for them to have all this test done. I would like to stress the need for increased funding and assistance to support civil society organization for HIV programs. Another key area of focus for HIV work in the Maldives is the migrant population as I said before, Maldives is home to a large foreign migrant labour population. As many of the migrants come from high burden countries, and play a significant role in our society, we recognise the need to scale up our targeted interventions and review policys in relation to HIV in this area. The Government will be working on this very closely with you Authorities, NGOs and Organizations to overcome all this issues as I said before. And Today, I would also like to announce our plans to establish a multi-sectoral coordination mechanism to harmonize existing mechanisms and to steer and oversee the program’s progress. Such a coordination mechanism will assist in saving costs, and ensure smoother implementation of programs. This mechanism will include Viral Hepatitis and HIV programs. And Finally, I am very pleased to be a part of this important event, and would like to use this opportunity to launch a national level campaign to call for more people to get tested for HIV and ‘know their status’. I hope many people, especially young people, get tested and become engaged in conversations about protecting themselves.